PHUKET: The 52-year-old Russian woman who was shot in a bungled burglary attempt at her home in Rawai on Wednesday (Aug 30), has identified the Nigerian man arrested by police yesterday (Aug 31) as the man involved in the incident. At 3pm today (Sept 1) at the Phuket Provincial Police Station, a press conference was held to announce more details on the arrest of Chijioke. Present at the press conference were Phuket Provincial Police Commander Maj Gen Teeraphol Thipjaroen, Phuket Provincial Police, Chalong Police Chief Col Prachum Rueanthong, Rawai Mayor Mr Aroon Solos and others. However, also presented at the press conference was a second suspect, Ms Sasipha Nakhonthaisong, 33, from Phuket. Col Prachum said, “Police managed to track down the suspect’s car from CCTV footage from outside of Ms Kharenko’s property. 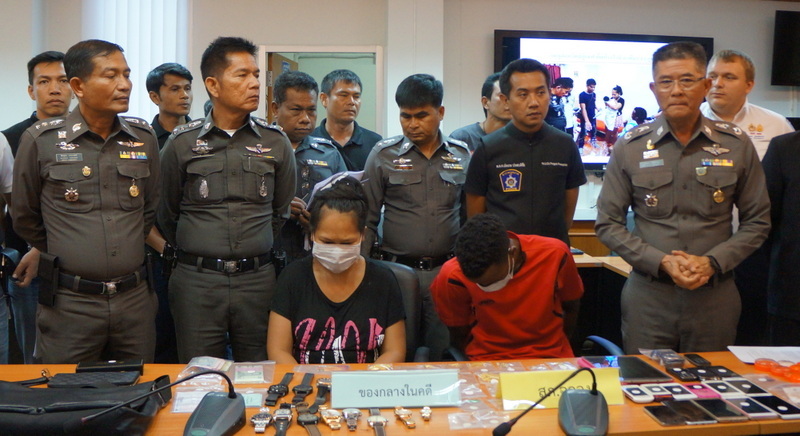 They then discovered that the second suspect, Sasipha, had used the vehicle to go and send a parcel to Bangkok. That parcel was intercepted by police who discovered that the parcel contained a notebook computer belonging to Ms Kharenko. “It appears that Ms Kharenko was a little confused when interviewed by police at the hospital as she said there may have been two suspect. However, from CCTV footage we were able to ascertain there was only one suspect. “Ms Kharenko was today able to identify that suspect as Chijioke,” Col Prachum said. Presented at the press conference were 92 items seized from the house in Rawai where police arrested Chijioke. Three victims reported to Chalong Police that their houses were broken into and items were stolen. Mr Younes Nasre, a Canadian national, told police that his house in Saiyaun was broken into on at about 9pm on July 27. Items stolen from a safe at his property included a Piguet watch, Admiral Cup watch and a Louis Vuitton handbag. Ms Saruttaya Amornprasert told police that her house in Rawai was broken into at 3pm on Aug 9. Items stolen included a famous Buddha amulet, pack of B20 banknotes, gold pig locket, pearl earrings and another two gold earrings. Ms Jirawan Vanderland told police that her house in Rawai was broken into at 8:30pm on Aug 10. Items stolen included a famous buddha amulet, two gold earrings, gold anchor locket and gold butterfly locket. All those items detailed in the above were presented at the press conference today. Maj Gen Teeraphol noted, “Chijioke still denies any involvement. He is staying in the country illegally and he does not have a job. “A six-year-old boy and a four-month-old baby boy who are the sons of Chijioke and Sasipha have now been put in the care of the Phuket Provincial Development and Human Security Office,” Maj Gen Teeraphol added. Chijioke has been charged with theft anmd attempted murder while Sasipha has been charged with theft. Wow, many high ranking police officers shuffling for the safari photo. Very different from that photo showing a large knife wielding tuk tuk driver. But of course, these 2 are no 'family'. I am always surprised how all these high ranking RTP find the time to go for this photo safari. How many captains and colonels bend over this simple case?